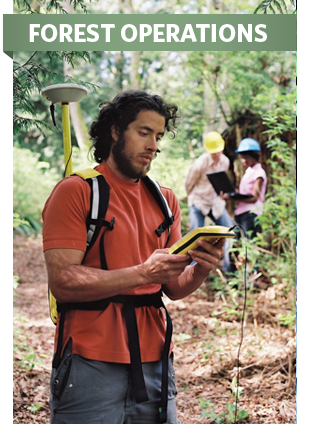 If you seek the challenge of applying technology and science to create environmentally and economically sound harvesting plans, then the Bachelor of Science in Forestry (BSF), Forest Operations major may be for you. Students are prepared for planning and implementing complex harvesting operations that maximize economic returns and minimize environmental impact. The program is based on biological, physical and social sciences, with advanced courses in geotechnical engineering, forest road design and slope stability, analysis of harvesting systems for economic efficiency and site protection, and planning and scheduling of harvests and transportation systems. Upon graduation, students from this program can apply to become Registered Professional Forester. Is it possible to remove trees from the forest without using roads or affecting the soil? Is it possible to harvest trees in patterns that mimic natural disturbances like windstorms, forest fires, and disease and insect damage? Can we erase all traces of the roads and the activities of the harvesting equipment once we have finished harvesting? Can we create cut blocks that disappear into the landscape? Are there harvesting machines that walk through the forest on mechanical legs, float over swamps, or carry logs on a cable just like a chairlift at a ski resort? Modern forest operations use state-of-the-art systems and high-tech machinery to meet the mechanical and engineering challenges of harvesting trees in a safe and environmentally responsible manner. Computer technology assists in the precise location of cut blocks, the careful development of roads, and the selection of efficient transportation systems to bring the logs from the forest to a processing facility. The environmental and social objectives we have for our forests must be protected during harvesting activities. Forest operations experts therefore have a strong background in ecology and forest management to develop systems that minimize disturbance within the forest. It is a varied education, drawing on the diverse disciplines of biology, ecology, mechanical engineering, physics, and economics. Forest operations provide the link between the growing forest and the wood products we use every day.